Mirror Mirror, though it may initially appear to be aimed at younger audiences, is in reality a verbally and visually witty take on the age old children’s story. 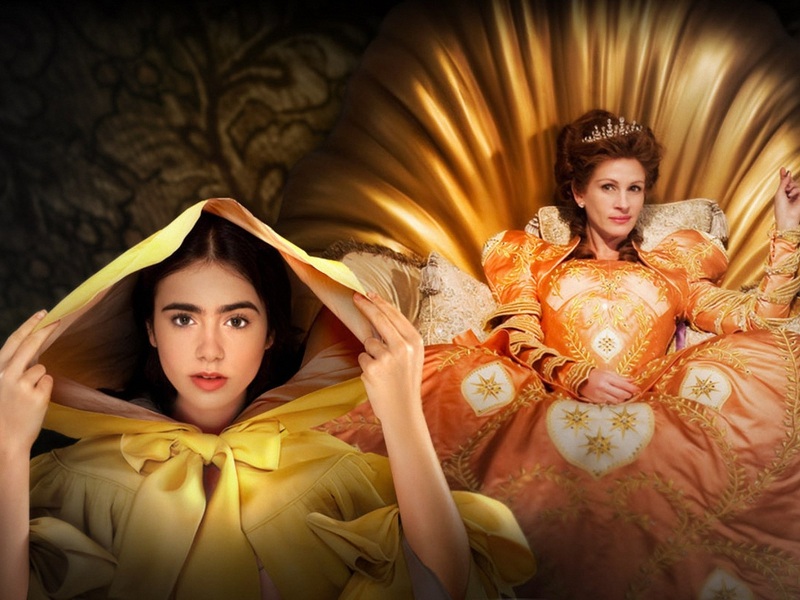 Given a liberal dose of ‘eastern promise’ by Indian director Tarsem Singh, and starring Lily Collins as the eponymous Snow White with Julia Roberts as a delightfully over-the-top and waspish wicked queen, the film is like a sugar frosted sleigh ride to hell. Poor little Snow White (Collins) is left in the care of her stepmother (Roberts) after her father the king disappears in the wild woods which lie beyond the safety of their castle’s ramparts. As the years pass, and it becomes clear that the king is not coming back, the queen banishes the young Snow White to her chambers and proceeds to bleed the surrounding country and its inhabitants dry of their natural and financial resources in order to fund her increasingly lavish lifestyle. But it appears the queen didn’t count on the resilience of her stepdaughter and on her 18th birthday Snow White escapes the confines of the castle to the woods and town beyond. What she discovers there so shocks her that she embarks on a course which will have life changing resonance not just for her but everyone in the spellbound kingdom. It’s good now and then to see a film which doesn’t take itself too seriously. Mirror Mirror is a film with something for all ages and that everyone involved in appeared to have a ball making. The flamboyant costumes, scenery and underlying feel of the film have the exaggerative air of The Never Ending Story (1984), but leavened with the surreal sharpness of The Company of Wolves (1984). So much so that, as with all good fairytales, though you feel safe in the knowledge that good will win out in the end, it’s often touch and go right up to the final twist in the tale. Screenwriters Melisa Wallack and Jason Keller clearly had a whale of a time concocting various mad scenarios (the piece-de-resistance being the Queen’s pre-party beauty treatment which provides a new take on the term ‘bee-stung’ lips) whilst keeping the essence of the original Brothers Grimm story. The pace of proceedings occasionally flags, the film getting a little ‘lost in the woods’ when it strays outside the castle, hence leaving the wicked queen on the back-burner. Collins is a feisty Snow White, Armie Hammer suitably chiselled and rugged as the prerequisite love interest Prince Alcott and Nathan Lane gives a manically wacky performance as the Queen’s sidekick butler Brighton. Even the film’s version of the seven dwarfs have enough of a new twist not to appear stunted. However the show ultimately belongs to Roberts’ wonderfully caustic stepmother. This is one ‘Queen Bee’ with a definite sting in her tail, as her apparently benign outward appearance masks a twisted and bitter inner persona, her acid putdowns seeping into the subconscious of her unfortunate subjects, destroying anyone who dares cross her as much by subtle corrosion of their will and enthusiasm as by any physical magic. A grittier interpretation of the fairytale, Snow White and the Huntsman (2012) starring ubiquitous pouter Kristen Stewart, was released around the same time. Frankly though I’d rather go with Roberts and Collins – they seem much more fun.